When I look at my colleagues, family, and friends it seems like everyone is on their mobile all the time. It’s not just about making calls or texting. Mobile applications (apps) cover notes, photos, social networking and now health. Yes, not just the count-how-many-calories-I’ve-eaten aspect of health but real health factors like your heart rate. 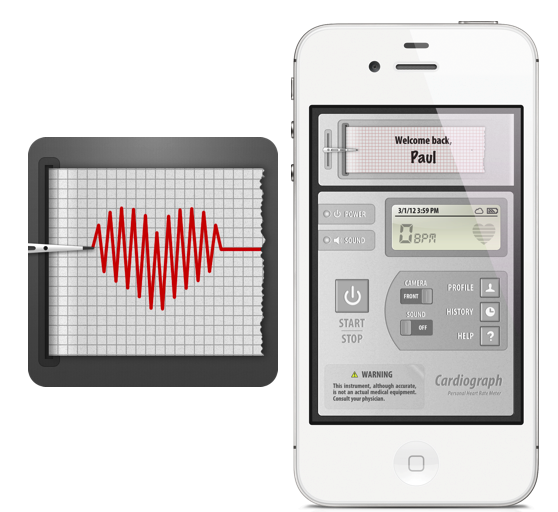 We apparently now have access to a Cardiograph or Heart Rate Meter App, which can measure our heart rate on the go. My mind immediately started racing over the numerous possibilities, both, from a layman’s perspective and in the context of healthcare. For most of us who work out to stay healthy or keep fit, the basic indicator of both our effort and fitness level is our heart rate. When you work out on a treadmill or other gym-based equipment you usually have some sort of monitoring system on the machine itself, which can be used to watch your heart rate. What about when you are walking, running or playing a field sport? This seems to be a simple and convenient solution considering that most of us have our music on our phones as we work out and so the equipment is already on hand. Coming to a more professional perspective, what really hit me was the healthcare implication. Take a patient with a known heart problem that whose condition has to be regularly monitored. Today, they have to make regular visits to a healthcare facility or have a fairly expensive portable device at their disposal. 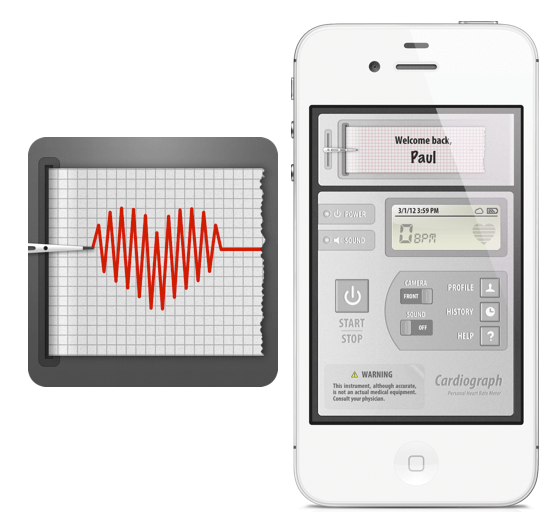 Alternatively, with the Cardiograph App, all the individual has to do is place their finger over their phone camera and wait for the recommended period of time. The data is recorded and stored for future use, which can be shared with doctor on his next visit. Assuming that most of us carry around our mobile phones at all times, imagine in the case of an unfortunate emergency, that the patient’s most recent records are available in his pocket! What remains to be seen is if the App actually works they way we think it will and if the accuracy levels are acceptable to the medical community and their patients in emergency situations. Personally, I don’t think we are at a stage where such technology will replace our more traditional methods of healthcare and monitoring completely. On the other hand, it will help create an era of more affordable and easily accessible healthcare facilities for all and that in itself is a small but significant step forward. Disclaimer: The author has not been contacted by Apple to write this article or compensated for this post. The English language beats me even today. “Laugh” is pronounced “laf” and “nation” is pronounced “náysh’n”. Something I could deal with if it was just a question of twisting your tongue. Oh no, just when we are getting comfortable with our silent letters, the question of context steps in and what better example than one of our favourite words ‘heart’. It doesn’t stop here. We have strong hearted, the weak hearted, the good hearted, the heavy hearted, the lightened heart, the broken heart, and the brave heart. When we think of the importance literature has given this single organ, it does seem that earlier the generations knew something we are just coming to realize. The heart is the life line for any human being. With the power of being Numero Uno comes vulnerability! Numero Uno’s are normally subject to attacks and so is the heart. Myocardial Infarction (MI) otherwise known as heart attack and other cardiovascular related diseases are today common ailments that strike humans. Incidence of cardiovascular diseases (CVD) in India is estimated to reach about 60 million in 2015. Today MI and CVD have the largest share amongst non-communicable diseases in India and prevalence rates amongst the urban population and young adults are likely to increase. The best way to fight any enemy is to understand them well, so let’s examine the most common causes of MI and CVD. Atherosclerosis is a gradual process, where cholesterol deposits build up on the arterial walls and narrow the inner channel of the artery making it difficult to deliver the required quantity of blood. This reduction in the flow of blood is said to cause MI and CVD. Smoking, high blood pressure, elevated cholesterol and diabetes accelerate the condition. Smoking cigarettes also poses a great risk. Nicotine is the leading cause of cardiovascular disease associated with smoking. Smoking causes atherosclerosis, high blood pressure and reduction in the flow of oxygen. Excessive consumption of alcohol increases the fatty deposits in the blood leading to atherosclerosis; which in turn raises blood pressure and the hence the risk of coronary heart disease. Diet, physical inactivity, and obesity are three other common causes of cardiovascular disease. Lack of exercise reduces fitness of the heart and increases the risk of MI and CVD. A person who is obese is more likely to get high blood pressure, high cholesterol and high blood sugar, again increasing the risk of heart disease. Knowing the common causes of heart attacks, what signs should we be watching out for? Sudden discomfiture; pain; pressure in the center of the chest that lasts for a couple of minutes; pain in one or both arms, neck, shoulder or jaw with or without the discomfiture in chest; shortness of breath with or without discomfiture of chest; lightheadedness and breaking out in a cold sweat are some symptoms that should not be ignored. If you experience any of the warning signs don’t panic. Stay calm. Call the SOS number that you have stored in your mobile phone. If you do not have one, create one now. Call for an ambulance. Do not drive. Else get someone close by to drive you to the nearest hospital. The immediate treatment you may receive at the hospital if the heart attack is confirmed are clot dissolving (thrombolytic) medications and or a coronary angioplasty. Preventive measures that we can adopt, as part of our daily lifestyle, to reduce the risk of MI and CVD focus on food and fitness. Cardiovascular exercises such as walking, running, cycling, swimming, skipping and rowing are commonly recommended. Do consult your doctor before embarking on an exercise regime. A balanced diet with vegetables and fruit, whole grains, low calorie and low fat content will also help a lot, along with no smoking and moderate alcohol consumption.